I’m been a reticent to write anything about the “Ground Zero Mosque“, partly because there’s not much that hasn’t already been said. Besides, who gives a damn what I have to say? So, before you consider trudging through what I have to say, you might want to read what CoUrTnEy and Obnoxio wrote. Infidel Blogger’s Alliance has covered the issue at length and our Canadian friends have some items about the issue as well. I won’t bother with trying to educate people on the issue. Instead, I’ll just share my opinion, which is probably worth less than your time. 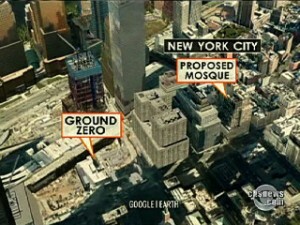 A major issue I have is with the “Ground Zero Mosque” being treated as a political issue. As long as laws are not broken, it is a private matter. However, I also have an issue with people acting like freedom of religious is somehow an exemption from all recourse. You have a right to practice your religion, however, I have a right to judge you accordingly and exercise my rights. Part of the problem is the massive bureaucracy. The government always oversteps their bounds, and when I talk about rights and how things should be, I do so without regard for existing laws. Let’s be clear, if the government wanted to, there is any number of legal ways for them to put a stop to the “Ground Zero Mosque“. Part of having Libertarian beliefs, is having the ability to set aside your personal morals and preferences in favor of the rights of others. So, for the governments part, I honestly do not believe they should want the mosque there (given the full context), however it’s none of their damned business. I have a major issue with things like zoning laws, permits, etc… Most of them are just a way for the government to intrude into your life. If you own property, it is yours to do with as you wish (with some understanding that you do no harm to your neighbors). One of the main reason I loath the government intrusion into private life and business is the simple fact that they can tell an individual that despite no resistance from their neighbors, they’re not allowed to locate a business there, or build there, etc… This is ridiculous, the government shouldn’t be going around closing down lemonade stands. If the KKK was able to acquire property near ground zero, and put a giant sign up saying that the “Jews caused 9/11″, if would be their right (although it might also be the right of Jews to sue for slander). The bottom line is it is not the government’s role to tell you what you can and can’t do on private property until/unless what you are doing has been proved to be a crime. Having said that, I am against the “Ground Zero Mosque”. I think it is in absolutely horrible taste. The location is not coincidence. When people involved are quoted as referring to it as the “Ground Zero Mosque”, and saying that America is to blame for 9/11, it makes their motives highly suspect. I can’t say for sure what they want to do. In a broader historical context, mosques have been built at the site of conquests. Perhaps this is simply done to elicit a negative reaction, so people can in turn say that Americans hate Muslims. Regardless, it’s a horrible idea and clearly not being done for the right reasons. This mosque could easily be located farther away, it’s not a big deal to the builders unless they want to make it a point of building where one of the plane’s landing gear ended up. So, how does one reconcile the difference between keeping the government out of the issue, and being justifiably upset? Well, this is through recognition of the rights of the individual. We don’t have to like what someone is doing to allow them to do it. On the other hand, we are not forced to sit idly by. In the case of the mosque there are many things we can do. We can blog about it, we can fund campaigns against it, we can vote against politicians in support of it, we can dig into the funding, we can expose the actions of those involved, we can shine a giant light on the issue and let everyone know what is going on. People close to the mosque can do much more. Construction workers can refuse to work (some have), banks can refuse to give out loans (or should be able to, if the government will let them), individuals (including moderate Muslims) can refuse to have any part in this. This is our right as individuals. Freedom of religion does not force us to sit idly by. This entry was written by KrAzY3, posted on August 22, 2010 at 4:18 pm, filed under Politics and tagged government intrusion, ground zero, Ground Zero Mosque, libertarian, libertarian beliefs, mosque, Obnoxio. Bookmark the permalink. Follow any comments here with the RSS feed for this post. Post a comment or leave a trackback: Trackback URL. The Victory Mosque affair has seriously damaged the image of The Religion of Peace™ in the eyes of ordinary Americans. We can consequently expect a lavish petrodollar-funded campaign of taqiyya (lying about Islam to the infidels) in the MSM, in an attempt to lull the public back to sleep. So, as a high priority to immunize the American people against the coming onslaught of Islamic propaganda, could bloggers please familiarize their readership with the techniques of lying, deception, feigned moderation, guilt-inducement, diversionary tactics, twisted logic and half-truths embodied in the Islamic practice of taqiyya. That reminds me of what Arafat used to do. I’ve commented on other forums about this and it’s a shame that many see it as black and white… one forum seemed to attract lot’s of right wing comments on this subject – for me, it’s this simple. They should be allowed to build the mosque there but they shouldn’t actually build the mosque there. From what I understand (correct me if I’m wrong) – the buidling is already a place of worship for muslims but it’s just not officially a mosque. In this regard, it should be irrelevant HOWEVER, it will be seen by many in the middle east as a twisted victory of sorts and that’s what grates. The most similar story here in the U.K was a proposed mega mosque near the new Olympic grounds in East London… however, the public’s expression of displeasure (for once) seemed to have an effect and that was called off. Most Americans agree with you, or most agree it should be allowed to be built but shouldn’t. I agree with their right to do so. However everyone knows they’re doing it for the wrong reason. I honestly haven’t seen much of the “They shouldn’t be allowed” talk, but rather a lot of people that know they know how screwed up their idea. Also, the building says Burlington Coat Factory on it and I’m pretty sure it’s been vacant since the landing gear crashed into it. AHH maybe I was midled; I was told that it was already a gathering place for muslims but this seems wrong now. TBH, I’m suprised there’s not more pressure being put on them to stay away – it woukld be ideal if they were never told that they can’t have a mosque there BUT with all the public outcry, it would be a blatant slap in the face and it couldn;t be seen any other way. I understand that there is already public outcry but it seems like they’re getting away with saying that they want to build it there as a tribute of sorts … very odd. There’s a lot of confusion and misinformation. I haven’t researched it enough to even unravel it all but here’s a few issues/questions/points. A: Apparently they said they owned all of the property when they didn’t actually own it yet. B: The person that secured the main real estate deal was a waiter a few years ago. There are serious questions as to how he reached his current position so swiftly. C: They do have a location near their current site apparently, but it’s not at the Burlington Coat Factory, which their religious leader has termed the site of the “Ground Zero Mosque”. It’s just a really complex and confusing issue. There’s serious questions about the funding and serious questions about the people behind it. Having said that, they have a right to try to build there and the government has no place to stop them (unless it turns out to be funded illegally). That doesn’t mean individuals have to play along though. People keep forgetting the rights of the individual in a given situation. A church has a right to move next door to me, but I have a right to refuse to sell my land to them (for example).